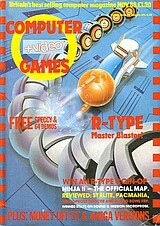 Cover Story R-Type: Master blaster! Note Comes with a free tape with a demo of R-Type for the Spectrum and C64. Small cheats and tips are on pages 103-104 and have not been indexed.